Medicines aren't always needed for minor illnesses like coughs and colds in children. If your child does need a medicine, it's important they have one that's right for their age and you know how to give it to them safely. Paracetamol and ibuprofen are safe for treating pain and fever in babies and children. Both are available as liquid medicines for young children. It's best to choose a sugar-free version. Medicines that contain sugar can harm your child's teeth. Make sure you get the right strength for your child's age and check the label for the correct dose. Or you can ask your pharmacist for advice. It's a good idea to keep one or both medicines stored in a safe place at home. At what age can I give my baby paracetamol or ibuprofen? You can give paracetamol to children aged two months or older for pain or fever. You can give ibuprofen to children who are aged three months or older and who weigh more than 5kg (11lbs). If your child has asthma, get advice from your GP or pharmacist before giving them ibuprofen. Don't give aspirin to children under 16 unless it's prescribed by a doctor. It's been linked with a rare but dangerous illness called Reye's syndrome. If you're breastfeeding, ask your health visitor, midwife or GP for advice before taking aspirin. See more about breastfeeding and medicines. Children don't often need antibiotics. Most childhood infections are caused by viruses. Antibiotics only treat illnesses caused by bacteria, not viruses. If your child is prescribed antibiotics for a bacterial infection, they may seem better after two or three days. But it's important to always finish the whole course to make sure all the bacteria are killed off. If you don't finish the whole course, the infection is more likely to come back. It also increases the risk of the bacteria becoming resistant to antibiotics. Antibiotics work best if they are given at regular intervals. Giving them to your child at the same times each day may help you to remember. Make sure you know how much and how often to give a medicine. Writing it in your child's Personal Child Health Record (PCHR, or red book) may help you remember. Always read the label on the bottle, and stick to the recommended dose. If in doubt, check with your pharmacist, health visitor or GP. 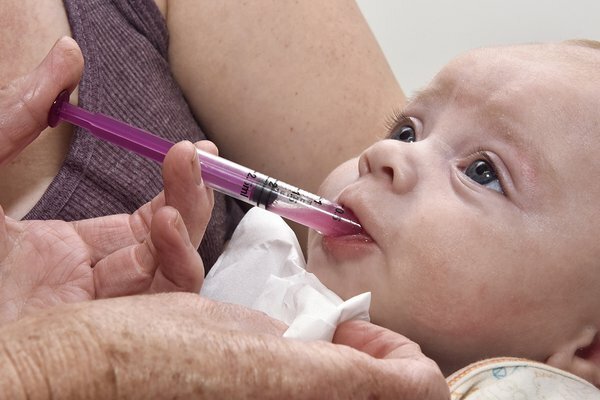 Most medicines for young children come with a special measure called an oral syringe. This helps you measure small doses of medicine more accurately. It also makes it easier to give the medicine to your child. If you're not sure, your health visitor or pharmacist can explain how to use the syringe. You can also watch a video from Great Ormond Street Hospital showing how to use an oral syringe. Never use a kitchen teaspoon to give your baby or child medicine, because they come in different sizes. The leaflet that comes with a medicine will list any possible side effects. If you think your child is reacting badly to a medicine – for example, with a rash or diarrhoea – speak to your GP, health visitor or pharmacist. In the evenings or at weekends you can call NHS 111. If you wish, you can report the side effect through the Yellow Card Scheme. Keep a note of the medicine's name in your child's red book for future reference. Can you get over-the-counter children's medicines for free? Some pharmacies run what's known as a minor ailment scheme for specific ailments, such as coughs and colds and diarrhoea and vomiting. When pharmacies provide medicines as part of a minor ailment scheme, you get the medicines on the NHS. You won't pay a prescription charge for children under 16. Not all pharmacies offer a minor ailment scheme, and the ailments covered by the scheme vary from area to area. Read more about the minor ailments scheme. Always check the expiry date – if you have any medicines at home that are out of date or your child no longer needs them, take them to your pharmacist to dispose of safely. Never give your child medicines that have been bought or prescribed for someone else. Always keep medicines out of your child's reach and out of sight. Ask your pharmacist about storing the medicine – some need to be kept in the fridge or out of direct sunlight.